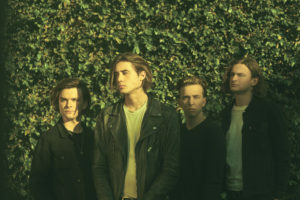 It’s still fairly early in 2019 but Perth, Australia export, The Faim, have already knocked off a pretty major milestone in their young career. In support of their debut EP, Summer Is a Curse, Josh Raven (vox), Sam Tye (guitar), Stephen Beerkens (bass/keys), and Linden Marissen (drums) embarked on their very first headline tour in January: a string of UK and European dates that resulted in sold our shows and venue upgrades to accommodate the demand of ears wanting to hear their arena-ready and buoyant alternative pop/rock songs like “Fire,” “Summer Is a Curse,” and “Saints of the Sinners” live. Less than two years ago The Faim played their first live show. Since then the lads have toured with bands like Sleeping With Sirens, PVRIS, Hands Like Houses, and PVMNTS and are now set to release their full-length debut in the fall. In the meantime, The Faim continue to build their tour leg muscles, this time by way of providing support for Black Veil Brides frontman, Andy Black, on a massive 28-date spring North American tour. Not only is touring hard work but it’s something of an art, so Linden gives a picture of it from The Faim’s view because tour happens…. There’s a marked responsibility difference between touring as a headliner and as a supporting act. You guys are fresh off of a big headlining run of your own and about to run around the US and Canada with Andy Black: how do you guys approach being support versus headlining? Are there any cities on this tour that you never been to and are looking forward to visiting? Think back: do you remember what it felt like the very first time that you officially went on a tour as a professional musician? What it felt like and how you felt when that tour was over? Other than the obvious answer of your gear, name 3 things that you simply CANNOT go on tour without. Do you have any specific tour Do’s and Don’ts? If so, what are they? Be honest: what are your eating habits like when you’re on the road? Key word: HONEST. Downtime is a very necessary thing so how do you like to spend a tour day off? By now, surely something absolutely awful/ridiculous/hilarious has happened during a tour or at a show, right? Tell me about one of those somethings. Finally and for the uninitiated: How would you describe a The Faim show? The Faim’s support tour with Andy Black kicked off on 4/7 and you can find all tour dates HERE.